More than 100 pieces of artwork created by Union County students are on exhibit at the Union County Heritage Museum in New Albany through May 16, 2018. Sculpture, hyperrealism, ceramics, water-color, acrylic, pen and ink, prints, multi media, pastels and more gives the viewer a wide range of creative efforts. For the second year in a row, Best in Show Award this year went to Madison Baker, East Union High School. 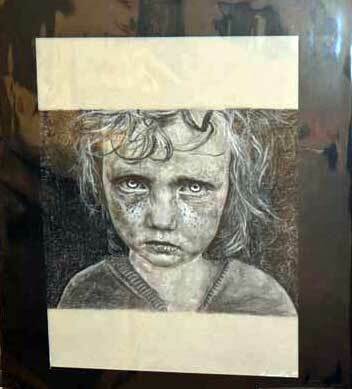 Her hyperrealism drawing, one of two entered, entitled Weak and Powerless, was of a homeless child. This year the Union County Art program has entries from all four high schools in the county. Teachers include Justin Treadaway, West Union; Austin Basil, East Union ; Jessica Waits, Myrtle and Amy Ball, Ingomar. The museum hosts student art annually from late March through May, allowing students to see their best work hanging in a gallery. The student purchase awards have been done annually for 12 years, enabling the community to have a local collection of the best student work. 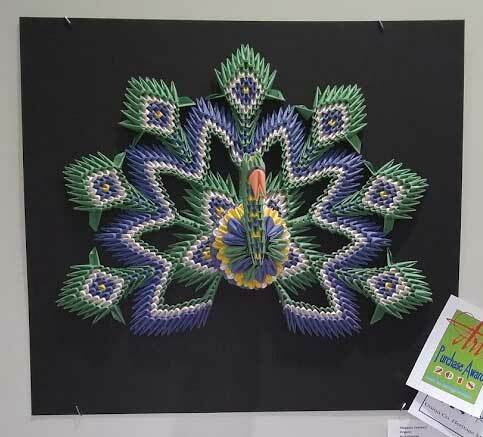 This year’s award goes to Anai Fuentes, Ingomar, for her paper sculpture Majestic Feathers.